This would be TRUE in a perfect world. However, daily stress, poor diet, aging, pollution, medications and many other factors can deplete your Glutathione levels to a point where you may not have all the Glutathione you need to stay healthy. So for many people, the real answer is: your body CANNOT make ALL the Glutathione you need to stay healthy. 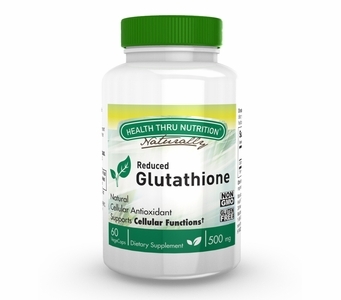 Glutathione Works as an Anti-Oxidant: Our Natural Reduced Form Glutathione is a powerful anti-oxidant specifically formulated with glutamic acid, cysteine, and glycine to play a vital role in supporting cellular function throughout your body. Glutathione�s key anti-oxidant role protects cells from free radical exposure. It also plays an important role in scavenging reactive oxygen and recycling other anti-oxidants � most notably, PQQ, Vitamin C and Vitamin E.
Glutathione Works in Detoxification: Since Glutathione is produced primarily in the liver, adequate levels may help support healthy liver function. Also, Our Natural Reduced Form Glutathione conjugates with heavy metals and toxins helping the body to eliminate these harmful substances. Glutathione Works in Immune Support: Our Natural Reduced Form Glutathione may help to enhance the body�s immune response by reducing oxidation. This may help to improve immune cell health and the body�s ability to fight disease. Glutathione Works for the Prevention of Un-Wanted Skin Pigmentation: Our Natural Reduced Form Glutathione may inhibit the activity of tyrosinase and production of melanin, which helps to prevent peroxy lipid generation by scavenging reactive oxygen. Why Health Thru Nutrition Reduced Glutathione? Our Natural Reduced Form Glutathione is, by its formulation, �Body-Ready� when you take it. Easier and faster absorption makes Natural Reduced Form Glutathione the MOST Bioavailable form of Glutathione available. In its Body-Ready, Reduced Form, this master antioxidant becomes the perfect vehicle to fortify your immune system, promote detoxification and skin health. Bottom line, as with for all of our products, we choose highest quality, purity, and clinically proven materials to ensure efficacy, safety, and best value for our customers. So, if you�re looking for Glutathione, you won�t find a purer or more effective product than Natural Reduced Form Glutathione � its Non GMO AND Gluten Free. Other Ingredients: Hypromellose, non-GMO vegetable magnesium stearate and silicon dioxide. Free of: Milk, egg, fish, shellfish, tree nuts, wheat, peanuts, soybeans and corn. Directions: Adults: take one (1) VegeCap daily as a dietary supplement, or as recommended by your health care professional.